Evangelical Identity and Gendered Family Life, by Oregon State University sociology professor Sally K. Gallagher, is a detailed study of evangelical attitudes toward gender and the family. Although many CBE members will be familiar with the basic issues summarized in part I of the book, there remains much to be learned from part II, where Gallagher reviews and interprets results from a major survey of American evangelicals. While her conclusions, presented in part III, are more problematic and must be reviewed cautiously, they still offer provocative and potentially useful ideas. Part I of the book presents a concise history of gender attitudes and debate among American Protestants, beginning with the Puritans. This history includes the origins of Christians for Biblical Equality. In fact, CBE is offered as representative for the views of "biblical feminists." Gallagher draws her understanding of the more traditional perspective from the works of Larry Christianson, Elisabeth Elliot, James Dobson, and others who believe that gender differences are not just socially-conditioned but biologically-based and willed by God. Part II contains the book's major contributions—data from the large-scale survey of American evangelicals and "how their religious identity . . . shape[s] their ideals for gender, work and family and influence their practices in everyday life" (p. 181). The study consisted of a telephone survey of over 2,000 randomly selected, "religiously committed" Protestants (together with a smaller comparison group of non-church-goers and non-Protestants), followed by face-to-face interviews of 173 religiously committed evangelicals. Gallagher focuses on questions concerning male "headship;" family responsibilities, leadership, and decision-making; and work both in and outside the home, including childcare and housework. Gallagher's study demonstrates that contemporary Christians have convictions that seem to contradict one another. For example, despite the fact that a solid majority of all Christians support male "headship," (90 percent of evangelicals, 70 percent of mainline denomination members, and 59 percent of liberal Protestants) most are ambivalent as to what this means. For those Evangelicals who support male headship, 84 percent agree that exercising it means being the "spiritual leader" of the wife, family, or household; 53 percent think exercising headship means being the "final authority" in decision-making; and 46 percent think exercising headship means being the primary breadwinner. These numbers suggest widespread belief in marital hierarchy. Yet the vast majority of evangelicals (87 percent) also claim that "marriage is a partnership of equals," with 78 percent supporting both equality and male "headship" (p. 75). 1 And whereas headship often de-notes dominance and authority, many of Gallagher's interviewees redefined headship in terms of personal sacrifice and responsibility for the family's spiritual welfare: "The emphasis is not on power but on the burden of responsibility that falls to men" (p. 72). This is not to say that today's evangelicals utterly reject traditional notions of male headship. Roughly 44 percent of those responding to the survey reported that in their marriages, the wife is more likely than the husband to "give in" on contested family decision-making. But 21 percent reported that in their marriages it was the husband who was more likely to give in, and over one­ third said that both partners are equally likely to yield to their spouse. The fact that over half of the evangelicals surveyed claim not to practice hierarchy in their marriages reflects a hither-to­ unsuspected, and high level of acceptance of egalitarianism. Gallagher does not make this point, however, and it is here, in its interpretation of what the data mean, that the book falters. For example, Gallagher's data indicate that most evangelicals practice what she calls "pragmatic egalitarianism" in real life, and document that evangelicalism has already absorbed much change in attitudes and behaviors about women's employment and men's involvement with childcare. She nonetheless concludes that "ideas of gender hierarchy and difference persist among evangelicals because they are the central metaphor for the ontological world view of this particular religious subculture . . . tinkering with gender ideals threatens a principle of hierarchy and difference that lies at the heart of the created order . . . tinker with gender, and you unravel the whole" (p. 174). Surely the high levels of divorce, fatherless children, and sexual promiscuity prevalent in American society suffice to explain evangelical concerns with retaining "family values" without the shocking assumption that "gender hierarchy and difference" is in any sense an important, let alone "the central" tenet of evangelical theology. It may well be that many ideas that Gallagher view as key to the evangelical worldview (including conservative theology about hierarchy in the Godhead, arguments about the "naturalness" of male/female differences, and even the observed remnants of family hierarchy2 are results rather than the causes of conservative Christian attempts to protect the family. 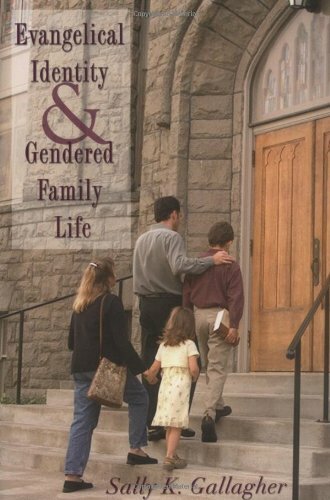 Evangelical Identity and Gendered Family Life's documentation of contemporary evangelicals' ambivalent language, thinking, and behavior regarding gender and the family offers much information and cautions for groups like CBE that want to encourage Christians on the path to full equality. Readers would be well advised, however, to draw their own conclusions as to exactly what its data mean. 1. I take issue with Gallagher's assumption that accepting the husband as "head" reflects a belief in marital hierarchy. In fact, she defines only those respondents who agreed with marital equality and disagreed with male headship as "fully egalitarian." However, I suspect many egalitarians accept the biblical designation of the husband as head. Where they differ from those who believe in marital hierarchy is in their belief about what that means. 2. Another complaint I have with Gallaher is that although evangelical attitudes about male "headship" seem to be the author's primary interest, it was the researchers and not the interviewees who brought up the subject in the first place. This makes it difficult to know just how big a role concerns over the distribution of power actually play in people's everyday thinking.